The Council of Urban Boards of Education (CUBE) supports urban school boards, fosters effective school district leadership, and addresses the educational challenges that exist in our nation’s urban centers. As part of our mission, CUBE creates educational opportunities for urban school board leaders to gain the knowledge and skills necessary to serve as effective local education policymakers and as advocates for excellence and equity in public education. We are committed to helping school boards to close the student achievement gap and provide all students an equal opportunity to receive a high-quality education—with a specific focus on meeting the needs of our nation’s historically underrepresented and underserved students. See what CUBE conferences, seminars, publications, and online resources are available to help your school board ensure excellence and equity in your schools. Contact CUBE to learn how your school board governance team can join CUBE and develop the knowledge and skills to be effective local school policymakers and strengthen academic achievement in your school district. Learn about the immense responsibilities that are shouldered by urban school boards—and how they work to educate many of the nation’s high-needs and historically underserved children. View our list of more than 100 urban school districts participating in CUBE. View demographic and contact information about the urban school districts participating in CUBE. Learn more about the leadership team that guides CUBE. Read more about the CUBE mission and the rules under which it operates. 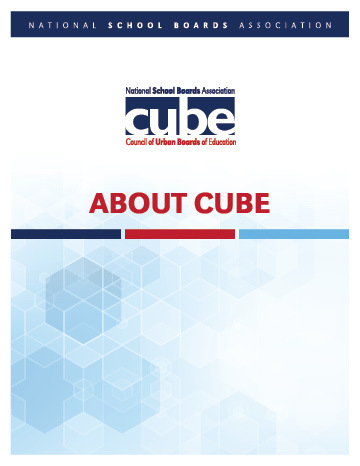 Learn more about CUBE task forces and their work to develop resources on important topics facing urban school districts. A National Dialogue - Chaos or Community?